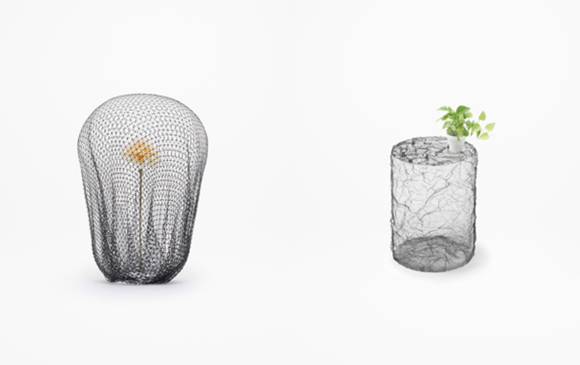 A collection of sculptural objects made by heat-forming agricultural nets ordinarily placed around fruit and vegetables to prevent them from harm by wind and animals. The nets are stronger than organdy but more flexible than wire mesh. Using them as a sculptural material allowed studio Nendo to evade the traditional necessity of combining structure with a separate surface material, to create a thin membrane that stands independently, but also floats gently on a breeze. The flower vase and bowl wrap the air like a furoshiki Japanese wrapping cloth. 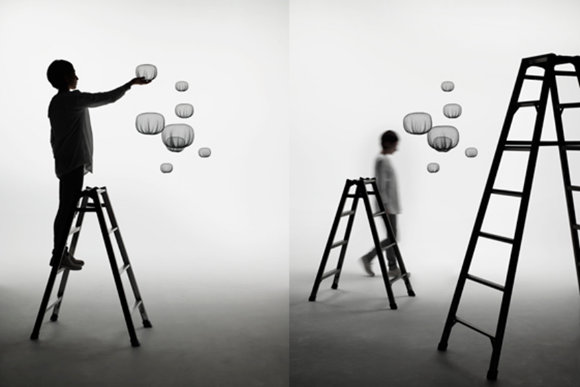 The lamp softly emits light, in the manner of a traditional Japanese paper lantern. The multiply-pleated table are reminiscent of the surface of Japanese shibori (tye-dying) textiles and hand-made paper. The action of gently wrapping something and close attention to the texture of the surface endow these objects with the very particular sense of expression found only in Japan, since ancient times.